Auckland City is harbor city and often referred to as the 'City of Sails.' This short fanfare composed in 2002 is a salute to the sailing vessels that sail and race with pride on Auckland's sparkling Waitamata Harbour. The composer has lived for over 25 years in Ponsonby, one of Auckland's oldest residential areas with 20th century Victoria style villas and cottages. Today, Ponsonby is caught between the glamour of renovation and the excitement of inner city living. It is a terrain of glossy expensive shops, designer boutiques, bars, restaurants and street cafes. The new elegance and romance of historic and modern architecture, living side by side, the hustle and bustle of today's lifestyle and the panoramic harbour views is portrayed in the music. Portrait was originally composed, as a commissioned work, for pianos. It was premiered under the title Duo Caprice in Auckland, July 1989. It was first performed under its new title Portrait of Ponsonby and as a full symphonic work in Nov/Dec 1999. This concert overture was commissioned by Auckland's Academy Youth Orchestra and first performed in 1994. 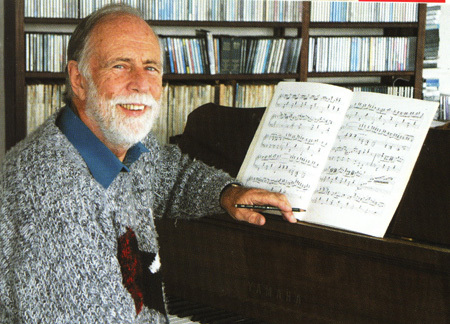 The two main themes were originally written by the composer as songs for a musical, but reworked and developed for this overture. 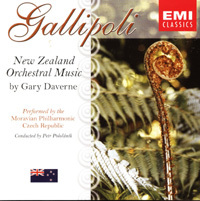 Gallipoli was composed in memory of the World War I battle that took place between Turkey and Anzacs, symbolizing as a whole, the mutual good relations of the countries of Turkey, Australia and New Zealand, which are in friendly relations in our day. The message given by Turkey's leader Ataturk after the war was one of humanism and friendship. This is still commemorated by both the ANZACs (Australian and New Zealand Army Corp.) and the Turks with great importance every year. This works was premiered on 16th May 2003 by the Turkish State Symphony Orchestra of Bursa with Turkey's renowned trumpeter Erden Bilgen as soloist and conducted by the composer. The idea of writing this solo work for trumpet was born when Erden Bilgen met the composer in Auckland. It became formalized with the composer's visit to Gallipoli in 2001 and a subsequent meeting between the two in Istanbul. 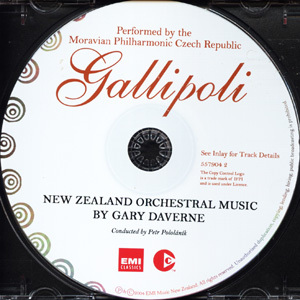 The music is not intended to interpret the horrors and negative aspects of war, but more the emotions and reflective times of the young ANZAC and Turkish troops summoned to war on Turkish ground. The opening trumpet fanfare is the call to war. In the middle section the composer uses a traditional folk theme from the Turkish region of Canakkale. Composed over 9 days in 2003, the idea of writing a piece of music with such a title developed while writing over a ten year period, an opera based on the life and hardships of Wesleyan and Anglican missionaries in the South Pacific. The setting for this opera is mainly in the northern region of New Zealand in the 1838s, leading up to the signing of the Treaty of Waitangi in 1840. The Pacific Island drums rhythms (Tongan) are the major features in the structures of the composition. This was a commissioned work for accordion orchestra premiered at the Royal Festival Hall, London, February 1993, with the composer conducting. Its New Zealand premiere was in July 1993 with Auckland's youth group 'Orchestra Nova', rearranged for symphony orchestra. This miniature overture is similar to a pocket containing many treasures, little "goodies" collected over a period of time. It consists of several snippets of the melodies and rhythms from the composer other compositions. A Pocket Overture was awarded first prize in the American ATG (Accordion Teachers Guild) 31st annual competition for original composition in July 1993. Alberton is a historic, romantic 18-room timber mansion in Auckland. In the late 19th and early 20th century it was famous for its hunts, garden parties, dances, music and friendly welcomes, which is still evident today. The atmosphere of the Victorian period, with the ballroom and spacious grounds is captured in this music. The powerful brass chords show the strong character of Allan Kerr Taylor, owner and builder of this stately home. The spirits of the three unmarried daughters, the last family residents, are solo woodwind features. The shimmering tremolo string passages and harp arpeggios depict the 'ghostly' games played by Aunt Muriel on the children. This work was commissioned by the Kaipara District Council in honors of the long time accordion and arts supporter and lifetime member of the New Zealand Accordion Association, the late Mrs Jenny Cocurullo. A respected and loved citizen of Dargaville, the main town in the Kaipara region in the north of New Zealand, Jenny always promoted the Kaipara as the 'Gem of the North'. She in turn was considered 'The Gem of the Kaipara'. The introduction of the piece is quite mysterious in nature, with the lower strings providing a subtle bagpipe-like drone. The airy melody and soft percussive effects are reminiscent of the awakening of the lush majesty Kauri tree forests and countryside of the Kaipara Flats with its blanketing dawn fog. The main themes are written around Jenny's name and the name of the region 'Kaipara'. The animated and rhythmical jig-like section portrays Jenny's boundless energy, various interests and Scottish heritage. The strings restate the soaring melody expressing the vast expansiveness and sweeping landscape of the Kaipara region. Originally, A Jazz Burlesque was composed as a piano solo and later arranged for accordion trio, and accordion orchestra. This string arrangement followed for all the female string ensemble 'String Silhouette'. They premiered it in Auckland, June 1993. The Moravian Philharmonic ranks among the foremost and oldest of symphony orchestras in the Czech Republic. Its home is in Olomouc, historical capital of Moravia. This ancient university town is an important educational, cultural and artist center for the whole of central Moravia. During more than 50 years of activities, the Moravian Philharmonic has created an exception large and varied repertoire. The orchestral intensively promotes contemporary national and international musical creations, the important 19th and 20th century world composers, inclusive of Czech classical music. Moravian Philharmonic has recently specialized in CD recordings of contemporary composers throughout Europe. It has taken part in an important international music festivals in Greece, Germany, Spain, France, Italy and Austria. Petr comes from a well-known family of musicians. As a conductor, he has worked with dozens of orchestras in Europe and U.S.A recording a number of CDs. Since 1996, he worked also as a teacher at the Church Conservatory in Kromeriz and at the Film College in Zlin. In summer 1998 and 1999, he led International Conducting Workshops in Kromeriz. In 2001, he became an Executive and artistic Director of the Karlovy Vary Symphony Orchestra. Today, Petr Pololnik devotes time to composition, arrangement and recordings with orchestra for the renowned film companies in U.S.A., Great Britain, Japan and Hong Kong. Marek belongs to a new generation of trumpet players in the Czech Republic. From 1995 he studied at the Conservatory of Music P.J. Vejvanovsky in Kromeriz with Prof. Jaroslav Racansky. 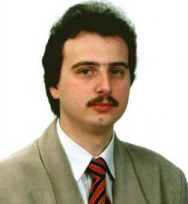 In 1999 he became a member of the Moravian Philharmonic Orchestra Olomouc and 2000 its solo trumpet player. In the same year he attended the Concerto Bohemia competition where he won first prize and laureate title. At present he studies at the University of Arts in Bratislava, Slovak Republic. 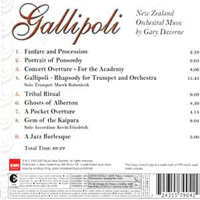 Gallipoli is his first CD recording. Born and raised in the Dargaville area, Northland, New Zealand, Kevin began playing the accordion at the age of nine. After earning the title of New Zealand Solo Accordion Champion for two years and representing New Zealand at the World Championships three times Kevin moved to the United States to study at the University of Missouri, Kansas City where he obtained his Bachelor of Music. In addition to the piano accordion, Kevin has also mastered the bayan (button accordion) and it is with this instrument that he furthered his studies at the Conservatoire XII de Paris. Kevin has performed internationally as a soloist and entertainer, on radio, television and in concert. After serving as a Vice-President for eight years, Kevin was elected, in 2004, President of the Confederation Internationale des Accordionistes (CIA),the umbrella organization for all the National Accordion Associations world wide, the first time ever that a non-European has held this title. Kevin currently makes his home in New York City where he has lived since 1989. CMRCZ is a company creating professional recordings of classical and jazz music for chamber up to full size symphonic orchestra music arrangement. Specializes in current authors composition from solo instrument, duets, trios and quartets to chamber and symphonic orchestra. CMRCZ records movie soundtracks and creates music bases for popular music projects. Engages foremost musicians of Czech Republic for its recordings. It makes exclusive use of the Czech Broadcasting Radio recording studio for its recordings. Provides Demo recordings for young soloist together with chamber or symphonic orchestra accompaniment. Provides production and distribution of CMRCZ recorded CDs under CMRCZ recorded CDs under CMRCZ label.